Lifeguard-Pro Sends Lifeguard Instructors & Water Safety Instructor Trainers to You to Train You on the Date You Reserve. Nationally Recognized. 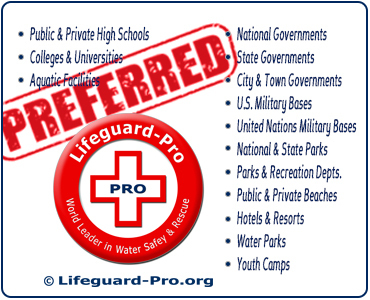 Lifeguard-Pro is nationally recognized and provides services in all 50 U.S. states. Lifeguard-Pro is a name you can trust! Certification is Super-Easy. Complete your online Home-Study Course in the comfort and convenience of your own home. Progress at your own pace. Stop and start as often as you like. Then, participate in a 1-day In-Person Training Session on the date you reserve. Lifeguard-Pro is undoubtedly the most convenient method of earning your Lifeguard or Water Safety Instructor certification! Ulta-Convenient Online Home-Study Course. You can start your convenient online Home-Study Course at anytime and from anywhere you have internet connectivity. Your online Home-Study Course consists of your course required textbooks, videos, exams, and forms. When you complete your online Home-Study Course, attend a 1-day In-Person Training Session to complete your certification course. Register for Your Online Home-Study Course Now! 1-Day In-Person Training Session. After completing your online Home-Study Course, participate in a 1-day In-Person Training Session in your local area. We service all 50 U.S. states and over 1,500 cities across America. So, wherever you are... we're nearby! You do not need to wait for a group of candidates to assemble in your local area. Our instructors will conduct your 1-day In-Person Training Session even if you're the only candidate in the class. How's that for convenience? To guarantee that you receive a convenient local 1-day In-Person Training Session, we don't require you to pay for it until you arrive at class. Guaranteed convenience! Register Now. Ready to get started? 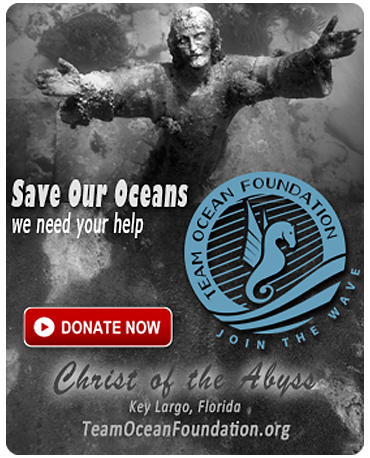 Go to our REGISTER NOW webpage and fill out the form. When you click SUBMIT, make sure your receive a "Thank You - Registration Success" message. Payment instructions will be automatically emailed to you. If you don't see the payment instructions in your email inbox, check your Spam/Bulk Mail Folder or just give us a call. We're here to help you from 9am-9pm ET, 7-days a week. Let's get started! Certification is Super-Easy. Complete your online Home-Study Course in the comfort and convenience of your own home. Progress at your own pace. Stop and start as often as you like. Then, participate in a 1-day In-Person Training Session on the date you reserve. Lifeguard-Pro is the most convenient method of earning your Lifeguard or Water Safety Instructor certification! Your Group Completes Online Home-Study Course. Your group members will complete a comprehensive online Home-Study Course to prepare them for their subsequent 1-day In-Person Training Session. Saves the employer time & money! 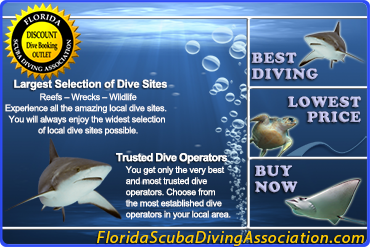 Local Instructors Train Your Group at Your Facility on the Date Your Reserve. After successfully completing our comprehensive online preparatory Home-Study Course, your staff will be fully prepared to participate in a comprehensive 1-day In-Person Training Session at your facility. Local, independent Instructors will go to your facility and conduct your staff training on the date you reserve. Super-convenient! Lifeguard Instructor. Get conveniently certified as a Lifeguard Instructor. Get paid for teaching and certifying Lifeguards. Set your own schedule. Be your own boss. The pay is great. We'll even refer paying students to you. Be a Lifeguard Instructor! Water Safety Instructor Trainer. Get conveniently certified as a Water Safety Instructor Trainer (WSIT). Get paid for teaching and certifying Water Safety Instructor (WSI) candidates. Set your own schedule. Be your own boss. The pay is great. We'll even refer paying students to you. Be a Water Safety Instructor Trainer! We’re available to help you from 9 am-9 pm ET, 7-days a week. Register for Your Online Home-Study Course Now! Lifeguard-Pro Sends Lifeguard Instructors & Water Safety Instructor Trainers to Your Youth Camp to Train Your Staff on the Date You Reserve. Youth camps across America love Lifeguard-Pro because we've earned your trust! At youth camp conventions across the country, youth camp directors loudly and repeatedly demanded a more convenient, more accessible, more reliable, and less expensive method of obtaining their camps' required Lifeguard certification courses, Water Safety Instructor classes, and CPR & First Aid courses. Youth camps across the country have chosen the nationally recognized Lifeguard-Pro as their trusted safety trainer. 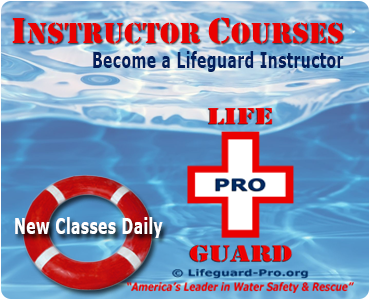 Lifeguard-Pro now provides Lifeguard certification courses, Lifeguard Instructor certification courses, Water Safety Instructor classes, Water Safety Instructor Trainer classes, CPR & First Aid courses, and CPR & First Aid Instructor courses to youth camps across the entire country. Learn why your peers consistently choose Lifeguard-Pro. Call: 954-607-2282 Reserve Your Lifeguard Instructor Certification Course Today! Lifeguard-Pro is recognized by the American Camp Association (ACA), and is widely regarded as a world leader in water safety & rescue training. We offer some of the most comprehensive and respected training programs in the world. We are dedicated to reducing the number of deaths by drowning by making public aquatics safety training more convenient & available than ever before. Nationally Recognized. Lifeguard-Pro is recognized by U.S. states across the country, and recognized by the American Camp Association (ACA). We have been an official business affiliate of the American Camp Association (ACA), and have serviced American Camp Association (ACA0 member camps across the U.S.A. for years. Lifeguard-Pro is a name you can trust! We attend numerous American Camp Association (ACA) Conferences across the country teaching American Camp Association (ACA) member camps how to upgrade their staff safety training to better protect against legal and financial disaster stemming from a drowning or injury occurring at their camp. Let our experience be your benefit! Prominent Youth Camp Organizations. Not only does Lifeguard-Pro service the American Camp Association (ACA), the largest and most influential youth camp organization in the nation, we also service camps from many other well-known organizations, such as YMCA, Girl Scouts of America, Boy Scouts of America, Easterseals, American Diabetes Foundation, Christian Camps Association, Jewish Camps Association, Western Independent Camp Association, numerous regional youth camp organizations, various state youth camp organizations, and many private youth camp organizations. Lifeguard-Pro is undoubtedly a favorite among youth camps! Our Youth Camp Program was Designed for You. We are very familiar with the youth camp business model. We listened to youth camp organizations, directors, and managers and created what many think is the very best lifeguard, water safety instructor, CPR, and first aid training program for youth camps. Our certification courses offer youth camps many significant improvements over the old program of yester-year. Isn't it time you discover why your peers choose Lifeguard-Pro? View Our American Camp Association (ACA) Brochure. View our national American Camp Association (ACA) brochure detailing many of the Lifeguard-Pro benefits. This brochure is distributed to American Camp Association (ACA) member camps across the country. Isn't it time you learned what your peers already know? More Convenient. Our certification courses all include a comprehensive online preparatory Home-Study Course that your staff can complete from anywhere in the world prior to arriving at your camp. Better Training. Our Home-Study Course is about 10 times more comprehensive than that of our competitor. We do not offer a course simply to make it easy for the lifeguard candidate. We represent your interests and we guarantee that your staff is trained to superior standards. Cuts In-Person Training Time in Half. Take advantage of our comprehensive online Home-Study Course. Your staff will already be 50% completed with their certification courses when they arrive at your camp. Better train your staff and cut required in-person training time in half! Legally Document Your Staff Training. All of your staff's online training activities are tracked and recorded for your benefit to better protect you in the event of a Wrongful Death or Personal Injury lawsuit against your camp. In the event of a lawsuit against your camp, you will likely be required to provide extensive documentation detailing your precise staff training to prove that your staff was trained and certified in accordance with youth camp regulations, your insurance policy requirements, and the published training requirements of your certification company. Our competitor's certification courses do NOT document the precise training provided to your staff, which can create a very expensive legal problem for you. Failure to precisely document your staff knowledge and training can create a hazard to your campers, and even put your youth camp out of business! Fortunately for you, all Lifeguard-Pro courses require every certification candidate to turn every page of each textbook, answer approximately two questions per page, view every video from start to finish, and answer every exam question with a total 90% correct score or higher. And, we document all of it in your candidate's records so that you can prove that your staff was meticulously trained to comply with all youth camp regulations, your insurance policy requirements, and the published training requirements of your certification company. Ignorance is Not a Legal Justification. Most youth camps don’t know they may be legally ordered to provide documentary proof of all knowledge and skills taught to their staff during their staff's safety training and certification process. Most youth camps discover that they should have legally documented the safety training and certification process only after a court has ordered them to produce records that they do not have. Let Lifeguard-Pro protect you with thoroughly documented staff training! Lifeguard-Pro was specifically designed to better protect your youth camp in the event of a Wrongful Death or Personal Injury lawsuit. We thoroughly document your staff training to better legally protect you. Don't let poor quality safety training documentation jeopardize the continued existence of your youth camp. Let our experience be your benefit! Professional Instructors Come to Your Camp. Unlike our competitor, we do not use inexperienced, part-time, seasonal, or volunteer instructors to conduct your staff's lifesaving training, just to save us money. Rather, we believe that your staff's lifesaving safety training should be provided only by experienced, professional rescue instructors. After all, the quality of your staff safety training can have life and death consequences to your campers, and catastrophic financial consequences to your youth camp. That is why we send only experienced, independent, local, professional instructors to your camp to train your staff. Don't you agree that your camp safety training should be conducted by experienced, professional instructors? Local, Independent Instructors Provide Training at Your Camp. After successfully completing our comprehensive online preparatory Home-Study Course, your staff will be fully prepared to participate in a comprehensive ONE-DAY (12 hours) in-person training session at your camp. The in-person training session usually begins immediately after breakfast and continues to the end of your staff's work day. During our ONE-DAY (12 hours) in-person training session at your camp, local, experienced, independent, professional instructors, will lead your staff through all the physical skills required for certification. Each candidate will successfully perform each required physical skill no less than 3 times, while under the direct supervision of the local instructor. Our competitor requires candidates only to successfully perform each required skill once. Lifeguard-Pro elevates the industry standard for lifeguard training! Local Instructors train at your facility, so that your staff can be trained in the environment in which they will be working. Training at your job site and practicing your facility’s Emergency Action Plan and Standard Operating Procedures undoubtedly make better lifeguards and a safer swimming area. We believe it is simply a poor risk management solution to employ lifeguards that have been generically trained at a faraway location by an unknown (possibly volunteer) instructor, when the quality of their training can be the difference between life and death for your campers. Quality safety training saves lives and protects your camp from lawsuits! Students Unable to Pass Course. We understand that you may have a significant investment in your youth camp staff. You may have even hired them from outside of the U.S.A. We respect that you may not be able to easily replace staff members, if they fail the course. Therefore, if a candidate is unable to successfully complete all course requirements during the scheduled class, the local Instructors will work with the challenged candidates for up to an additional 4.0 hours to help them improve their performance so that they can satisfy all certification requirements. If after additional instruction the candidate is still unable to satisfy all course instructions, the candidate will be invited to participate in any neighboring youth camp training session at no additional charge. Lifeguard-Pro works for you! Reserve Your In-Person Training Date. Not only do we send local, experienced, independent, professional instructors to your youth camp to conduct your staff required safety training, they do it on the date you reserve. That's right, you can have local instructors professionally conduct your staff safety training at your camp on the date you reserve. Lifeguard-Pro services so many youth camps across the country and around the world, and most of them open for business at the same time. Consequently, we sell out every year from March 1 - July 31. So if you are considering using our services, please book early. Don't miss this great opportunity! Nationally Recognized Lifeguard Certification. We all know that youth camps present unique aquatic hazards and risks to campers; and, there are specific laws, regulations, and rules that dictate the legal operation of youth camp aquatic facilities. Yet, there has never been a nationally recognized lifeguard certification course that trained candidates to identify and respond to these unique youth camp hazards and risks, and comply with these specific youth camp operating requirements. Since you are being held responsible for your staff being able to effectively prevent and respond to the unique aquatic hazards and risks of a youth camp, comply with youth camp operating laws, regulations, and rules, doesn't it make sense to train your staff to these requirements? Lifeguard-Pro creates better youth camp lifeguards! FREE Upgrade to Lifeguard-Youth Camp Certification. For FREE, we upgrade all of your Lifeguard-Swimming Pool and Lifeguard-Waterfront staff certifications to the only Nationally Recognized Lifeguard-Waterfront + Youth Camp certification. The national Lifeguard-Waterfront + Youth Camp certification includes all of the training of the Swimming Pool and Waterfront courses, plus the youth camp specific Lifeguard-Youth Camp training to make your aquatic staff better prepared to prevent and respond to youth camps hazards and risks, and comply with applicable youth camp operating laws, regulations, and rules. A lifeguard specifically trained to work in a youth camp is undoubtedly a superior risk management choice over a generic lifeguard. 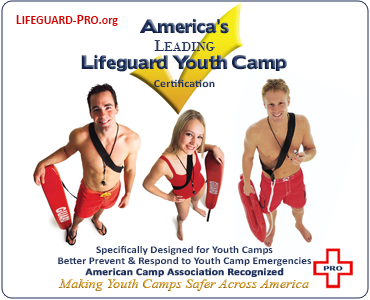 Isn't it time you upgraded to the Nationally Recognized Lifeguard-Youth Camp certification? The upgrade is FREE for licensed youth camps! We provide you with all of your staff certification cards immediately at the end of training, and before our instructor leaves your property! No more waiting for certification cards. No more running the legal risk of opening your aquatic facility before you have all of your staff certification cards in hand. Lifeguard-Pro protects you better! We provide all customer services to your candidates, so that your camp administrators can concentrate on other important camp business. We of course offer customer service via email. In addition, we offer customer service telephone support from 9am-9pm EST, 7-days a week. We know youth camps often recruit their staff from outside of the USA, and we’re prepared to help you. For your international students, we provide a FREE international phone number, live text chat, and live video chat support from anywhere in the world! Lifeguard-Pro is prepared to conveniently and professionally service your staff, no matter where they're located around the globe. Let's get started! This pricing option is extremely competitive and convenient. We service so many youth camps across the country and around the world that we offer these valued customers this special discounted rate. This discount guarantees you that you are receiving the same steeply discounted price as youth camps across the country. Discover why so many of your peers choose Lifeguard-Pro! Isn’t it time you joined your peers and upgraded to Lifeguard-Pro? Includes Textbooks, Videos, Exams, Forms, and In-Person Training on the Date You Reserve! If the Youth Camp National Discount isn't a low enough price for you, choose from one of our other incredible price options. 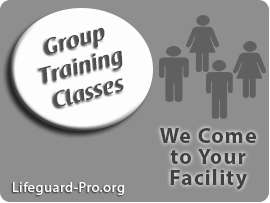 You deserve the best safety training, and Lifeguard-Pro is dedicated to making sure you can afford it! To be qualify for this outstanding option all you have to do is simply provide us with the verifiable invoice for your training last year. Lifeguard-Pro guarantees you a lower price! 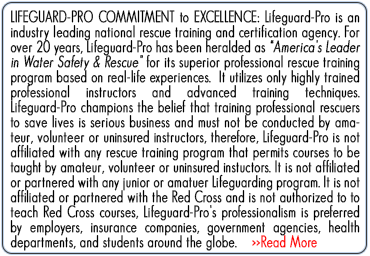 Lifeguard-Pro will only provide training that is in full compliance with all ACA standards. This price option guarantees that Lifeguard-Pro will provide safety training to your group at a lower price than our competitor. That’s right…Better Training and Better Convenience at a Better Price! With our LOWEST PRICE GUARANTEE you will only pay 90% of the lowest priced similar safety training course in your local area. Lifeguard Instructor. Gain control over your own staff required Lifeguard certification training by enrolling one of your trusted staff in our Lifeguard Instructor course. You'll be able to host, train, and certify your own Lifeguards! Water Safety Instructor Trainer. Gain control over your own staff required Lifeguard certification training by enrolling one of your trusted staff in our Water Safety Instructor Trainer (WSIT) course. You'll be able to host, train, and certify your own Water Safety Instructors! Lifeguard-Pro is widely regarded as a world leader in water safety & rescue training. We offer services in all 50 U.S. states; over 1,500 American cities, and over 30 countries around the world. Nationally Recognized. Lifeguard-Pro is recognized by the American Camp Association (ACA). We have been an American Camp Association (ACA) official business affiliate, and have serviced ACA member camps across the U.S.A. for years. Lifeguard-Pro is a name you can trust! We attend numerous ACA Conferences across the country teaching ACA member camps how to upgrade their staff safety training to better protect against legal and financial disaster stemming from a drowning or injury occurring at their camp. Let our experience be your benefit! Prominent Youth Camp Organizations. Not only does Lifeguard-Pro service the American Camp Association (ACA), the largest and most influential youth camp organization in the nation, we also service camps from many other well-known organizations, such as YMCA, Girl Scouts of America, Boy Scouts of America, Easterseals, American Diabetes Foundation, Christian Camps Association, Jewish Camps Association, numerous regional youth camp organizations, various state youth camp organizations, and many private youth camp organizations. Lifeguard-Pro is undoubtedly a favorite among youth camps! Professional Instructors Come to Your Camp. Unlike our competitor, we do not use inexperienced, part-time, seasonal, or volunteer instructors to conduct your staff's lifesaving training, just to save us money. Rather, we believe that your staff's lifesaving safety training should be provided only by experienced, professional rescue instructors. After all, the quality of your staff safety training can have life and death consequences to your campers, and catastrophic financial consequences to your youth camp. That is why we send only experienced, local, independent, professional instructors to your camp to train your staff. Don't you agree that your camp safety training should be conducted by experienced, professional instructors? Local Independent Instructors Provide Training at Your Camp. After successfully completing our comprehensive online preparatory Home-Study Course, your staff will be fully prepared to participate in a comprehensive ONE-DAY (12 hours) in-person training session at your camp. The in-person training session usually begins immediately after breakfast and continues to the end of your staff's work day. During our ONE-DAY (12 hours) in-person training session at your camp, your local, independent, professional instructors, will lead your staff through all the physical skills required for certification. Each candidate will successfully perform each required physical skill no less than 3 times, while under the direct supervision of our instructor. Our competitor requires candidates only to successfully perform each required skill once. Lifeguard-Pro elevates the industry standard for lifeguard training! Students Unable to Pass Course. We understand that you may have a significant investment in your youth camp staff. You may have even hired them from outside of the U.S.A. We respect that you may not be able to easily replace staff members, if they fail the course. Therefore, if a candidate is unable to successfully complete all course requirements during the scheduled class, the local Instructor will work with the challenged candidates for up to an additional 4.0 hours to help them improve their performance so that they can satisfy all certification requirements. If after additional instruction the candidate is still unable to satisfy all course instructions, the candidate will be invited to participate in any neighboring youth camp training session at no additional charge. Lifeguard-Pro works for you! Reserve Your In-Person Training Date. Not only do experienced, local, independent, professional instructors go to your youth camp to conduct your staff required safety training, they do it on the date you reserve. That's right, you can have them professionally conduct your staff safety training at your camp on the date you reserve. Nationally Recognized Lifeguard Certification. We all know that youth camps present unique aquatic hazards and risks to campers; and, there are specific laws, regulations, and rules that dictate the legal operation of youth camp aquatic facilities. Yet, there has never been a nationally recognized lifeguard certification course that trained candidates to identify and respond to these unique youth camp hazards and risks, and comply with these specific youth camp operating laws, regulations, and rules. Since you are being held responsible for your staff being able to effectively prevent and respond to the unique aquatic hazards and risks of a youth camp, comply with youth camp operating laws, regulations, and rules, doesn't it make sense to train your staff to these requirements? Lifeguard-Pro creates better youth camp lifeguards! FREE Upgrade to Lifeguard-Youth Camp Certification. For FREE, we upgrade all of your Lifeguard-Swimming Pool and Lifeguard-Waterfront staff certifications to the only Nationally Recognized Lifeguard-Waterfront + Youth Camp certification. The national Lifeguard-Waterfront + Youth Camp certification includes all of the training of the Swimming Pool and Waterfront courses, plus the youth camp specific Lifeguard-Youth Camp training to make your aquatic staff better prepared to prevent and respond to youth camps hazards and risks, and comply with applicable youth camp operating laws, regulations, and rules. A lifeguard specifically trained to work in a youth camp is a superior risk management choice over a generic lifeguard. 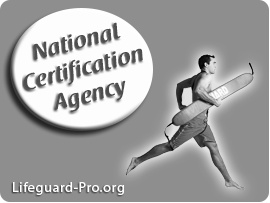 Isn't it time you upgraded to the Nationally Recognized Lifeguard-Youth Camp certification? The upgrade is FREE for licensed youth camps! We’re available to help you from 9 am - 9 pm EST, 7-days a week. Why Have So Many Youth Camps Chosen Lifeguard-Pro? The American Camp Association (ACA) recognized the Lifeguard-Pro training program makes it quick and easy for youth camp staff to obtain their required Lifeguard certification courses, Water Safety Instructor classes, and CPR & First Aid courses! Provides You with Incredible Prices; as a youth camp, you are entitled to national youth camp discount pricing and our LOWEST PRICE guarantee! Youth camps love Lifeguard-Pro so much that all Lifeguard-Pro classes across the country sell out every year from March 1 - July 31. Reserve your youth camp training for the dates that are most convenient for you. Youth camps that wait until March to book their training reservations often discover that their fellow youth camps have fully booked all Lifeguard-Pro services so that Lifeguard-Pro has no available training dates remaining. Book your training reservation now! If you'd prefer to talk, rather than read, simply call our friendly customer service team. We'll be happy to answer all of your questions and check availability for you. We're available to help you from 9:00 am - 9:00 pm EST, 7-days a week. If you haven't already done it, get your camp staff Lifeguard certified. This is our most popular course, so space is always limited. Don't miss out! Reserve your lifeguard certification class now! Reserve Your Class. Purchase the online preparatory Home-Study Course for your camp staff now, and reserve your In-Person Training Session date at your youth camp. Then, simply instruct your camp staff to complete the Home-Study Course working at their own pace in the comfort and convenience of their own homes. You'll be able to rest easy knowing that you have a guaranteed In-Person Training Session at your camp on the dates that you selected. We handle all customer service during the Home-Study Course and all instruction during the In-Person Training Session. You can sit back, relax and focus on other important camp matters. Let our professional experience be your benefit! We Sell Out Every Year from March 1 - July 31 -- Book Now! Lifeguard Re-certification is quick and easy! Lifeguard Re-Certification classes fill up faster than all other classes, so reserve your training class today. In one quick and easy course, your camp staff can renew all of their Lifeguard, CPR, AED, and First Aid certifications! Youth camps waiting till March often discover that all classes in their area are sold out! Reserve Your Class. Purchase the online preparatory Home-Study Course for your camp staff now, and reserve your space for an In-Person Training Session date at your youth camp. Then, simply instruct your camp staff to complete the Home-Study Course working at their own pace in the comfort and convenience of their own homes. You'll be able to rest easy knowing that you have a guaranteed In-Person Training Session at your camp on the dates that you selected. We handle all customer service during the Home-Study Course and all instruction during the In-Person Training Session. You can sit back, relax and focus on other important camp matters. Let our professional experience be your benefit! Youth camps can now easily train their managerial staff to be Lifeguard Instructors and Water Safety Instructor Trainers. 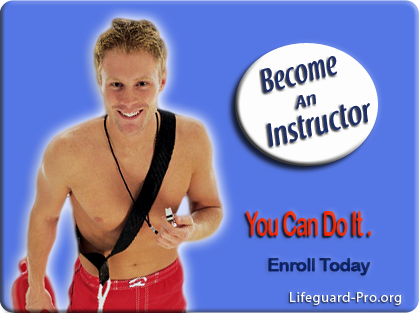 Becoming a Lifeguard Instructor or Water Safety Instructor Trainer is easy. You'll be able to host your own classes and certify your own camp staff in Lifeguard, Water Safety Instructor, CPR & First Aid. Take control over your required employee training. No longer be at the mercy of outside vendors to provide your business' required Lifeguard, Water Safety Instructor, and CPR & First Aid training. Lower your training cost, and increase your convenience! 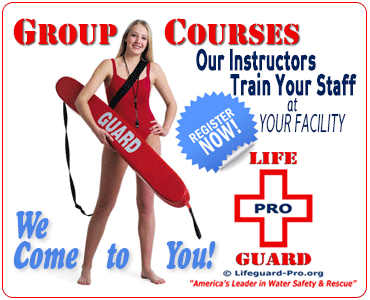 Enroll in your Lifeguard Instructor course or Water Safety Instructor Trainer class today. We will even come to your facility to train and certify you on the dates that you reserve. Lifeguard-Pro welcomes capable Lifeguard Instructor candidates. With a little dedication and effort, your camp managerial staff can be Lifeguard Instructors! Your camp managerial staff will be able to train and certify your camp's Lifeguard candidates this season! Don't be at the mercy of outside vendors any longer to provide your required Lifeguard, CPR & First Aid safety training. Take control of your camp's required employee training. Lifeguard Instructor candidates will learn online, and then work with a professional Lifeguard-Pro Authorized Lifeguard Instructor Trainer for a few short days at your youth camp on the dates that you reserve. After successfully completing the Lifeguard Instructor certification course, your camp managerial staff will able to conduct your camp's Lifeguard certification courses and certify your staff Lifeguards! All Lifeguard Instructor certification courses will sell out from March 1 - July 31. Plan ahead and schedule a Lifeguard Instructor certification course at your camp--you can even reserve the dates that are most convenient for you! The Water Safety Instructor (also known as "Swim Instructor" or "Swim Teacher") is our second most popular course, so it sells out very quickly! Get your youth camp staff certified to teach swim lessons at your camp. Conduct the course In-Person Training on the dates that you reserve. Don't wait to reserve your Water Safety Instructor course at your camp. Act now. All Lifeguard-Pro Water Safety Instructor classes will sell out from March 1 - July 31. Reserve Your Class. Purchase your online preparatory Home-Study Course for your camp staff now, and reserve your In-Person Training Session date at your youth camp. Then, simply instruct your camp staff to complete the Home-Study Course working at their own pace in the comfort and convenience of their own homes. You'll be able to rest easy knowing that you have a guaranteed In-Person Training Session at your camp on the dates that you selected. We handle all customer service during the Home-Study Course and all instruction during the In-Person Training Session. You can sit back, relax and focus on other important camp matters. Let our professional experience be your benefit! Make sure your camp staff is ready to teach swim lessons at your camp this summer. Renew their Water Safety Instructor certification online now. Enroll your camp staff in a Water Safety Instructor Home-Study Renewal Course today--they won't miss a single day of teaching swimming! Simply instructor your camp staff to complete the Home-Study Course. Upon completing the Home-Study Course, your camp staff will be able to start teaching swim lessons immediately! An individual with significant aquatics teaching experience who wants to be certified to certify Water Safety Instructors (aka Swim Instructors). All classes from March 1 - July 31 will sell out. A good instructor candidate plans ahead. Reserve your Water Safety Instructor Trainer course today, and start teaching Water Safety Instructor students this season! Don't miss out on another camp swim teaching season!